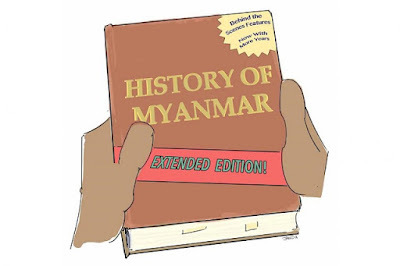 Commentary on "Learning from the past"
It is really a positive development that Myanmar Historical Commission has been formed and tasked with writing an objective history. Important is that pre-colonial, colonial and post-colonial history writing timeline would need to be demarcated. While the former two periods of pre-colonial and post-colonial could be based on available documents domestically and internationally, the post-colonial period of parliamentary, military, plus the recent quasi civilian-military eras or periods would be based more on oral history, besides printed documents that have been produced by the regimes of the day and also critical literature that were published during the corresponding periods. As the military era was based on the sole "Bamar and military supremacy" approach and propaganda, which still has sizable followings until today under the recent quasi civilian-military rule, this needs to be corrected. And it is here that the historian would need to tell history as it is and not in anyway being influenced by anybody's pre-concieved idea, if history is to be treated as history and not propaganda. Tons of guidelines on how to write history objectively is available today for the Myanmar Historical Commission and it only needs to have a look at it and make use of them accordingly.